Photo by Bryan Stevens • Purple finches are mainly winter visitors in the region, although they may make appearances during their fall and spring migrations. Although similar to house finches, purple finches have their own unique appearance once observers become familiar with them. The notched tail, evident in this bird, is a good way to distinguish purple finches from very similar house finches. The region experienced its first brush with wintry weather with the snowstorm that arrived Dec. 8. With a few inches of snow on the ground, some birds that had been ignoring my feeders decided to give them a second look. American goldfinches, dark-eyed juncos and a red-bellied woodpecker made frequent visits to the feeders over the weekend as more snow and cold temperatures put a temporary stop to the mild start of the 2017-2018 winter season. So far, the feathered clientele at my feeders are the expected visitors, including Carolina chickadees, downy woodpeckers, song sparrows and white-breasted nuthatches. Some birds, such as pine siskin and purple finch, which can make feeder watching an exciting winter pastime, have not yet made an appearance. Both these species belong to a group of birds known in birding circles as “Northern finches” that also includes species like red crossbill, evening grosbeak and common redpoll. Photo by George Gentry/U.S. Fish & Wildlife Service • A male evening grosbeak perches on the side of a sunflower-stocked feeder. The purple finch, which is a winter visitor to northeast Tennessee, southwest Virginia and western North Carolina is apparently not as common as in past years. Some experts have speculated that the decline in the numbers of purple finches each winter can be attributed, at least in part, to the closely related house finch. Today, the house finch is quite widespread, found across the United States. Originally, however, the house finch was a bird of the western part of the country, living in Mexico and the southwestern United States. About 1940, the house finch became established in the eastern United States. In violation of federal law, these small finches were being sold in New York City as pet birds described as “Hollywood Finches.” To avoid trouble with authorities, vendors and even some owners released their “Hollywood Finches” into the wild. Finding the area around New York City to their liking, house finches spread. Within a few decades, they were common birds throughout the eastern United States, including Tennessee, Virginia and North Carolina. The house finch had also been introduced into Hawaii about 1870, and is still present today, along with many other species of birds not native to the island. Photo by Bryan Stevens • A male house finch perched on a cable. These finches are native to the western United States but became established in the eastern states thanks to the illicit pet trade. As the house finch claimed a new range, they inevitably encountered the related purple finch. During the winter, both finches are often present at feeders in the region. When both are available for observation, bird enthusiasts should take advantage of the opportunity to compare and contrast these birds. Personally, I have never had any difficulty distinguishing a purple finch from a house finch. The two species, at least in my eyes, are easily recognized. I can understand why some people might have trouble separating the two birds. The late Roger Tory Peterson once described the purple finch as a bird “dipped in raspberry juice.” Think about that imagery for a moment and you’ve got a good start to distinguishing a male purple finch from a male house finch. Unfortunately, the description does nothing to distinguish females of the two species. Let’s deal first with the males. Male purple finches are delicate pink-red (that raspberry coloration) on the head and breast, mixing with brown on the back and cloudy white on the belly. The red of a male purple finch is definitely a color I have not observed with many other birds. Even “red” birds such as male Northern cardinals and male scarlet tanagers do not show the same red color. Once you learn the way the red appears in the plumage of a male purple finch, you are on your way to telling this bird apart from its relative. Early naturalist and artist John James Audubon painted this depiction of purple finches. The red in the plumage of male house finches is surprisingly variable. In most cases, the heads, necks and shoulders of male birds are reddish and the red at times extends to the stomach and between the wings on the bird’s back. The intensity of the red changes with the seasons and is also derived from the berries and fruits in the bird’s diet. Pale yellow and bright orange are alternatives to the typical red plumage. Look closely at the photograph of the purple finches accompanying this column. There’s a distinctive facial pattern evident on the birds. The strong facial markings include a whitish eye stripe and a dark line down the side of the throat. This pattern simply doesn’t exist with the male house finch. When I make a snap identification of these two birds, I always look for the facial pattern even before I study any other aspects of the appearance of the bird. In addition, purple finches have powerful, conical beaks and a tail that appears short and is clearly notched at the tip. Rounding out the description of a male house finch is the fact that they have a long, square-tipped brown tail and are brown or dull-brown across the back with some shading into gray on the wing feathers. The breast and stomach feathers may be streaked. Females of both house finches and purple finches are dull brown birds that could easily be mistaken for sparrows. Again, the facial pattern is much more apparent on a female purple finch than on the related female house finch. In addition, I have always noticed that female purple finches are usually a darker shade of brown than the dull brown female house finches. Both male and female house finches are more slender than their more chunky-bodied counterparts. In the United States, another close relative of the house finch and purple finch is the Cassin’s finch of the western United States. Together, the three species make up a classification known as the American rosefinches. Formerly placed in the genus Carpodacus, these three birds are now in the genus known as Haemorhous. The new classification separates them from the Eurasian rosefinches, which includes more than two dozen species including scarlet finch, great rosefinch and crimson-browed finch. 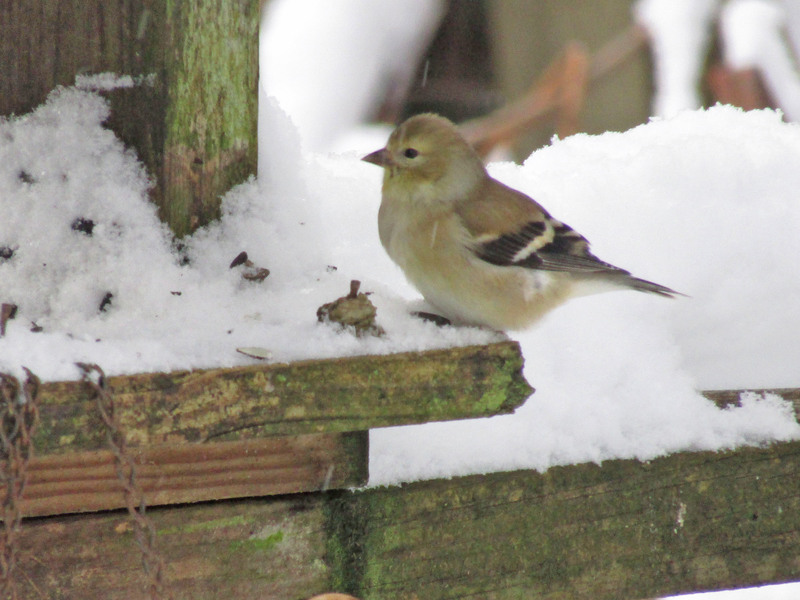 Purple finches occupy a variety of winter habitats, including fields and woodland edges, as well as yards and gardens. All it takes to lure these finches to your feeder is a plentiful offering of sunflower seeds. If you are lucky enough to have both of these finches visiting your feeders, take time to study the differences. It takes some practice, but they can be distinguished quite confidently. Merry Christmas to all my fellow bird enthusiasts! This entry was posted in 2016, Birding, Birds, Birds and bad weather, Bristol Herald Courier, Elizabethton Star, Erwin Record, Johnson City Press, Jonesborough Herald and Tribube, Kingsport Times, McDowell News, nature, Northern finches, Purple Finch, purple finches, Uncategorized, Winter birds and tagged Bristol Herald Courier, Bryan Stevens, Elizabethton Star, Erwin Record, Feathered Friends, Feeding birds, Johnson City Press, Jonesborough Herald and Tribune, Kingsport Times-News, McDowell News, North Carolina, Northern finches, Our Fine Feathered Friends, Purple Finch, Tennessee, Virginia, winter, Winter birds on December 24, 2017 by Bryan Stevens. All photography by Bryan Stevens • An American goldfinch feeds during the snowfall from Winter Storm Helena. Although its been many years since grade school, I still enjoy a good snow day. Much of the snow from Winter Storm Helena fell overnight, so I awoke on a Saturday morning to see a tranquil blanket of ice crystals that would have made a perfect white Christmas had the storm arrived only a few weeks earlier. Winter Storm Helena has produced the only significant snowfall so far this winter in Northeast Tennessee. Of the many things I pondered on my lazy Saturday morning was the fact that we didn’t used to name our snowstorms. After a quick consultation with Google on my computer, I learned that The Weather Channel kicked off this trend of bestowing names on winter storms back in the fall of 2012. I guess the rest of the media quickly followed suit. I do have Winter Storm Helena to thank for a definite uptick in the number of birds seeking out my feeders for an easy meal of sunflower seeds or suet. I gazed out a window for most of the morning, keeping watch on the mixed flock of birds that made a steady pilgrimage to the feeders. 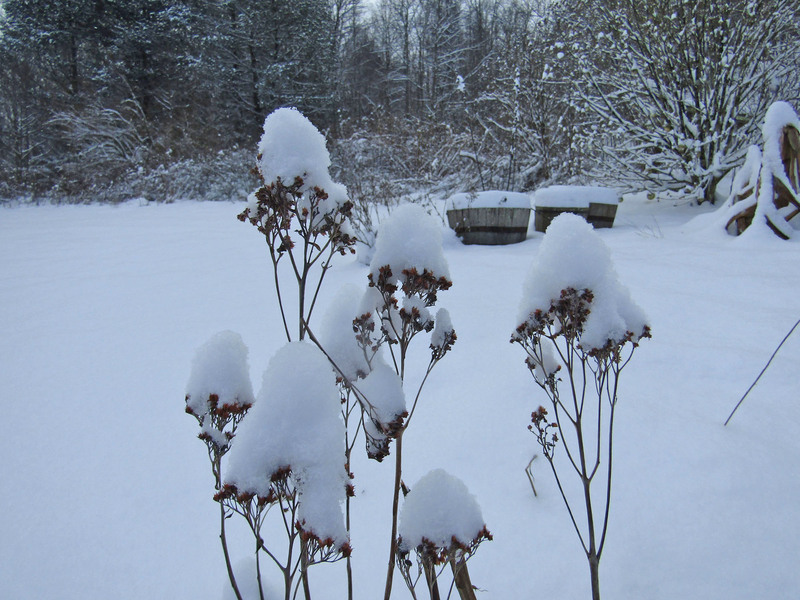 A feisty flock of dark-eyed juncos, its members racing across the snow-covered ground beneath the feeders in search of seeds dropped by other birds, could easily claim the distinction of being among the most faithful visitors. The “snow birds” kept their position near the feeders for most of the day. Other common visitors included the frantic tufted titmice and Carolina chickadees. These tiny bundles of feathers are always engaged in a perpetual race to grab a seed, fly to a perch, eat the seed, then repeat the process. An occasional solitary downy woodpecker or no-nonsense white-throated sparrow broke the sameness in the ranks of the flocks. A flash of red signaled the arrival of a male Northern cardinal. Noisy screeches signaled the arrival of blue jays. The jays ate quickly and soon departed. A least bittern climbs through wetland vegetation at Huntington Beach State Park in South Carolina. 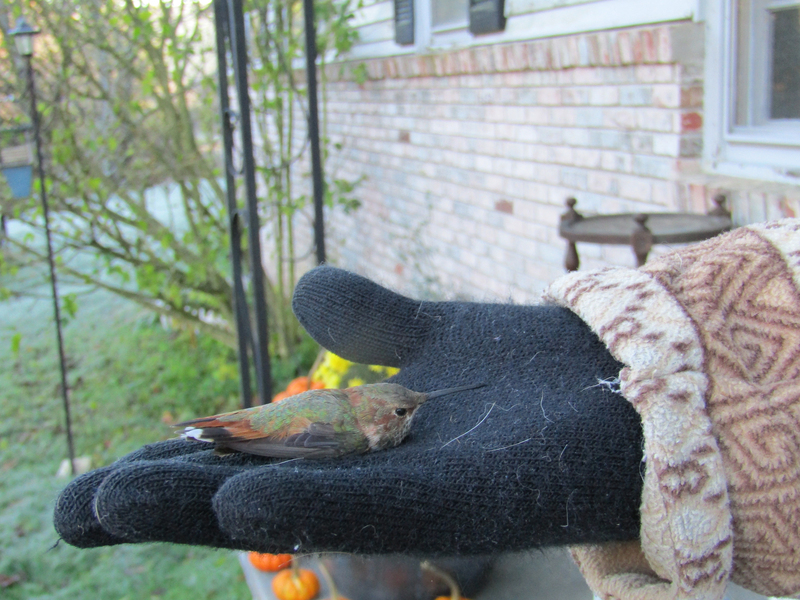 A rufous hummingbirds rests in a gloved hand after being banded. • During a June trip to South Carolina, I saw a life bird. It’s not often that I get to add a new species to my list, so I was quite pleased. The bird — a least bittern — also represented the final species of heron that I needed to complete my observation of all North America’s herons. 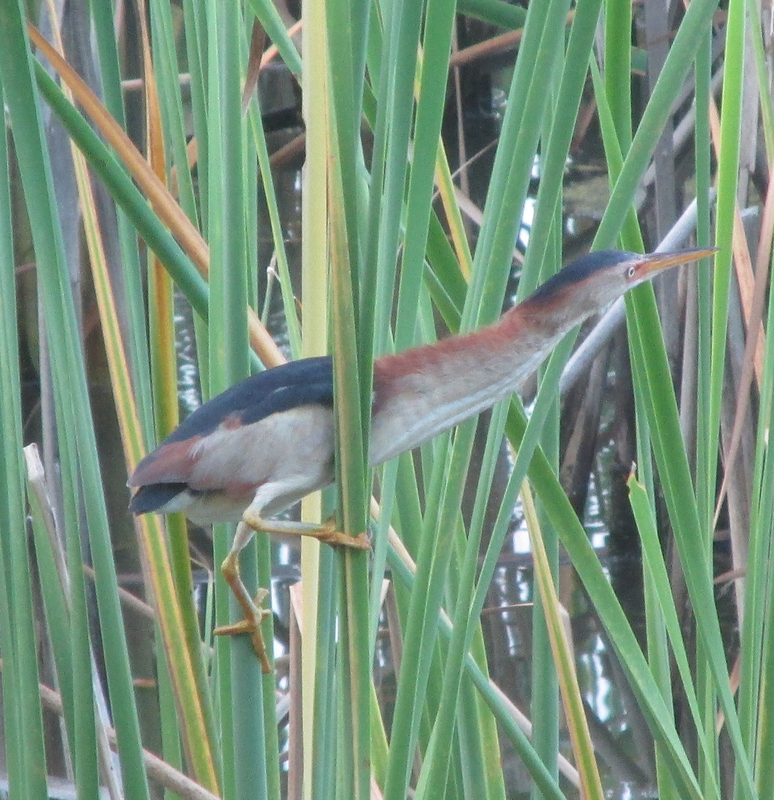 I saw the least bittern — very briefly — on the first day of my visit to Huntington Beach State Park. Not trusting my eyes, I declined to acknowledge I’d seen this diminutive heron. A few days later, on a tip from another birder, I got my “official” look at this bird, as well as some photos. • A male rufous hummingbird visited feeders maintained by my mother and me from Oct. 7 to Nov. 5, 2016. I can be confident in the identification of the bird because noted bird bander Mark Armstrong traveled to my home to capture, document and band the bird. Now, with a tiny band around its leg, if the hummer returns next year we might be able to confirm it’s the same bird. This is the third sighting of a rufous hummingbird I have made at my home over the past several years. Three young Eastern phoebes share a crowded nest. • Eastern phoebes build a nest on my porch fan. When I returned home after my summer vacation, I was delighted to find a pair of Eastern phoebes had built a nest on the blades of the ceiling fan on my front porch. Needless to say, the fan was taken out of commission during their nesting activity. 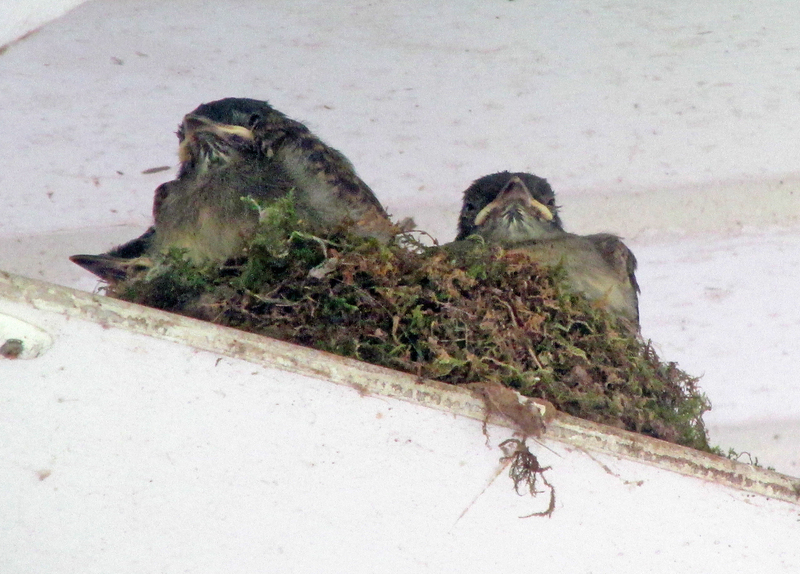 The phoebes raised three fledglings, giving me a daily glimpse into their progress. During the recent snowstorm, I had a single phoebe foraging in the willows at the creek. I speculated that the bird could be one of the now mature nestlings from this summer’s porch nest. The mother hummingbird Bliss tends her two offspring. • Last year was a stellar year for hummingbirds, which have always been one of my favorite birds. I’ve always been curious about hummingbird nests, but I’ve never succeeded in finding one. I still haven’t found one, but I was invited by Bluff City resident Donna Ottinger to visit and see a ruby-throated hummingbird nest in a maple tree in her yard. 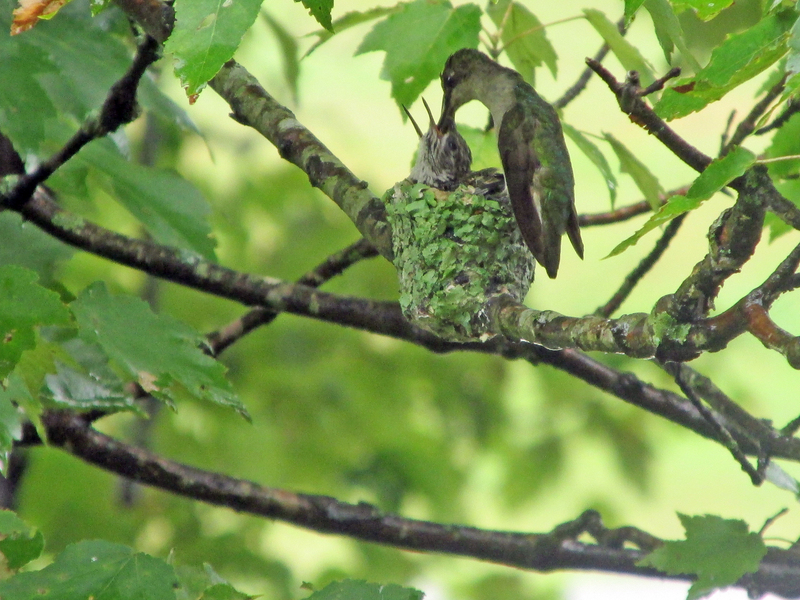 It was an incredible experience to see my first ruby-throated hummingbird nest, still occupied at the time by two tiny hatchlings being dutifully tended by their mother, a hummingbird Donna named Bliss. Rufus, a ruffed grouse, resides in Flag Pond in Unicoi County. 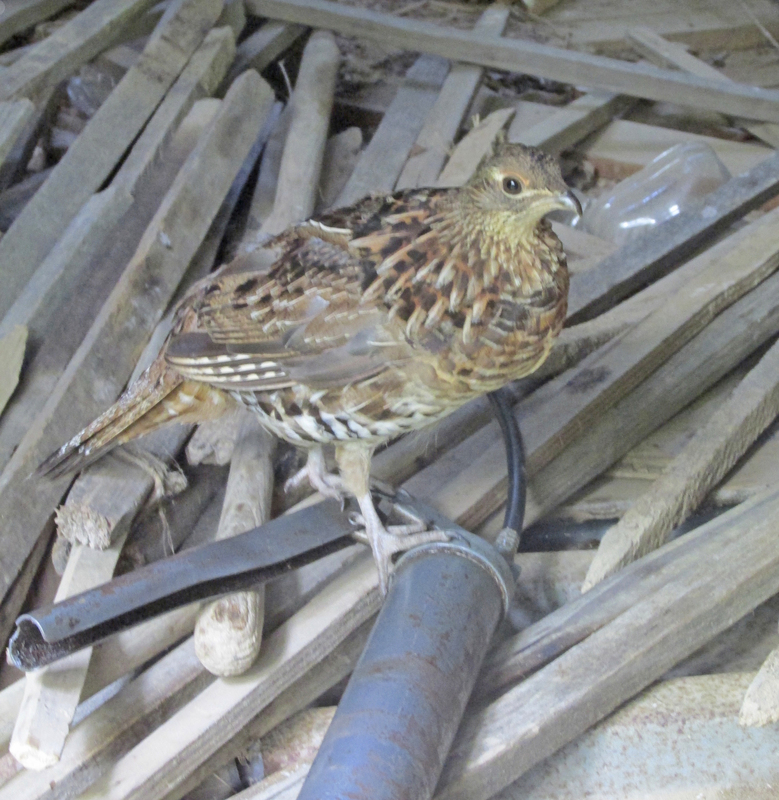 • I met a most unusual ruffed grouse this past year in the mountains near Flag Pond in Unicoi County, Tennessee. The grouse, by the name of Rufus, has been a fascinating and funny neighbor to Leon and Janice Rhodes for the past couple of years. I met Rufus on Saturday, June 25, at the Rhodes family farm. Brayden Paulk, a grandson of the couple, had invited me. The unique wild grouse acted like one of the family. The memorable meeting ranks as one of my most fascinating bird observations. If anyone had asked me at the start of 2016 what I expected from the year, I would never have predicted adding a least bittern to my life list or making the acquaintance of a grouse named Rufus. I can look forward with confidence to another round of delightful birding surprises in 2017. This entry was posted in 2016, Birding, Birds, Bryan Stevens, Bryan Stevens Feathered Friends, Uncategorized, Winter birds, Winter hummingbirds and tagged Birding, birds, Bristol Herald Courier, Bryan Stevens, Elizabethton Star, Erwin Record, Feathered Friends, McDowell News, Northeast Tennessee, Our Fine Feathered Friends, The Erwin Record, Winter birds on January 22, 2017 by Bryan Stevens.